This took place eleven months ago. In the intervening time David replaced William as caretaker of the Tecosky estate, near Parrsboro, Nova Scotia, on the north shore of the Bay of Fundy. William had been recovering in the main house. 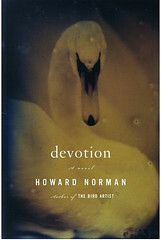 The above are the opening lines of William Norman’s 2007 novella Devotion. And a wonderful opening it is. I am an absolute sucker for books about past crimes and wrongdoings, and this opening raised plenty of questions. Why were they fighting? Was William pushed? Was the presence of the taxi just dumb luck? What about David’s wife, William’s daughter? And have David and William reconciled? Why is David taking over William’s job? And “had been recovering”—has William recovered, or is he dead? We learn early on that David first met William’s daughter, Margaret, in London on April 13, 1985. The two fell in love almost immediately, but we know from the beginning that trouble is around the corner, although we don’t learn the details of what led up to the trouble until the final few chapters of the book. 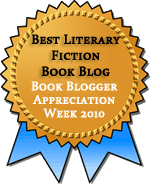 Most of the book deals with their whirlwind courtship and the aftermath of the fight and the ensuing accident. To David, the simple fact was love at first sight. The moment provided the definition. He felt a complete realignment of emotions, along with the unbearable advance regret at not seeing this woman again. Whatever her name might be, whatever her life might be. He felt these pangs, felt them almost hypnotically. The storyline focused on the aftermath of the accident is less successful, although it has its interesting moments. There’s some wonderful writing involving the swans that live on the estate that William, and now David, has the care of. These swans are a source of pride for William, but David is afraid of swans, having been attacked by one at a young age (and at a moment of particularly strong emotional vulnerability). Swans, like love, are beautiful things, but when they turn on you, which they can do with surprising swiftness, they can be violent and cruel. It’s a motif that works, but there’s so much other stuff that doesn’t. One problem is that the story bounces back and forth in time, and the time line was not always clear. Norman is careful to give a date in the first sentences after most of the transitions, but for me, there were too many dates, too close together, to keep track of. In many books with nonlinear storylines, the emotional trajectory is such that I can know where I am without even knowing the date. That was not the case here. Another problem is that the book is simply too jam-packed with imagery and characters. Besides the swans, there’s also David’s photography, used to record at a distance. There’s music—the classical ensemble that Margaret travels with and the operas William listens to. And there’s a veterinarian who gets several pages of description but has no clear and meaningful place in the story, other than taking care of the swans. And of course there’s a couple who have been through the Holocaust. Any one of these elements and characters could be made to work for the story, but it’s too much for a mere 190 pages. But even worse than the overstuffed feeling of the book is the banality of it. I’m going to try to avoid spoilers, but if I were to tell you the reason for the fight, you would probably roll your eyes as I did at the extreme unoriginality of it. All that build up, for that? Really? And then the way the characters act afterward is the worst possible sort of romantic melodrama. Everyone gets manipulative, and no one speaks forthrightly. The characters’ bad behavior wouldn’t bother me, though, if it were interesting bad behavior, but it isn’t. It’s boring. I’m not sure where I ran across this book, but it’s been on my shelf for ages. It was the first time I’ve read anything by Howard Norman, and I understand that he is well-regarded for his other books. The Bird Artist and The Museum Guard were both shortlisted for the National Book Award. I can see why. Some of his prose is quite lovely, but in this book, the story just isn’t there. It’s a shame that however strong the writing, it wasn’t enough to make up for the muddled story. The passages you posted were really arresting, and I certainly would have been interested in this one, but I think I would ultimately find it unsatisfying. It is a shame because the writing was quite good. I may try another of his books one day. It appears that this one mostly got negative reviews or was ignored, so I perhaps started in the wrong place. I’m sorry that such pretty prose is wasted on a pretty mediocre story- I’ll give this one a miss. He does have a new book that seems to be getting some positive attention, so perhaps the prose gets put to better use there or in one of his earlier books.